J & J Nursery is having a fun contest again this year! The winner will be chosen on December 15th by our very own employees. 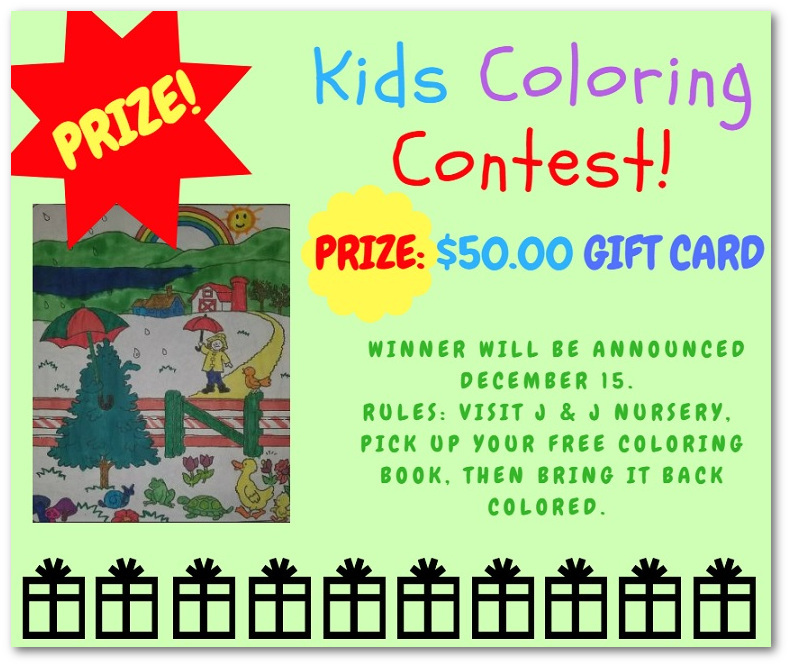 Just stop by and grab a Christmas tree coloring book, color a page, and return it with a name and phone number. Many gift card prizes available! We hope to see you all soon! This entry was posted in Christmas, Christmas Trees, J&J's Nursery, Spring, The Woodlands, Tomball, TX and tagged #holidaycontest #SpringTX #Houston #Texas #coloringcontest, Christmas Trees Spring TX, Christmas Trees Tomball TX, Christmas Trees Woodlands TX on November 24, 2018 by jjsnursery. Watch us unload Christmas Trees from the semi truck! 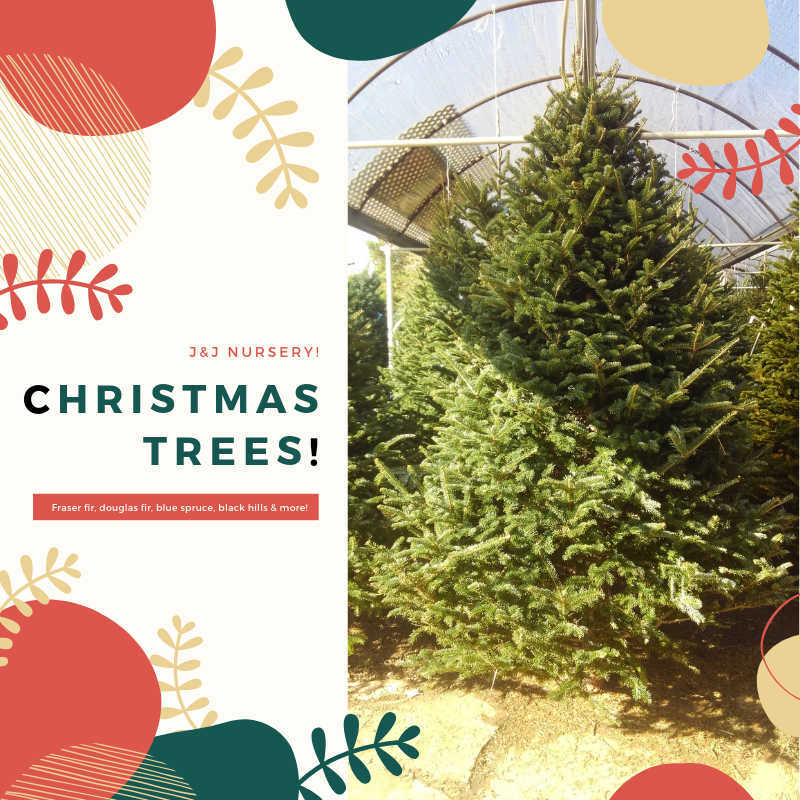 These are fraser firs, douglas firs, blue spruce, black hills and more! Trees are in a variety of sizes from 6 feet to 14 feet. Smaller table top trees are available too. 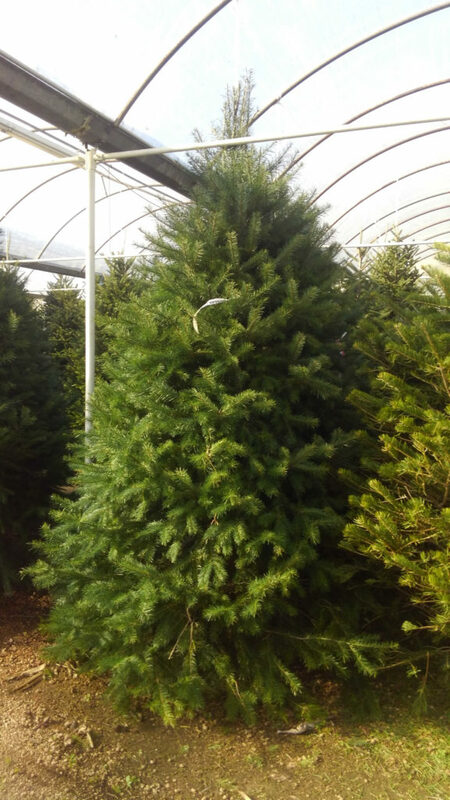 We have trees for all your decorating needs from very full and wide to thin and fewer branches! 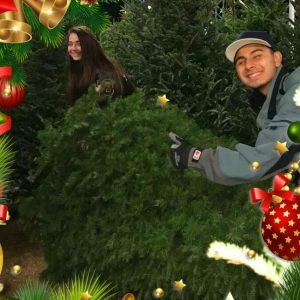 The Christmas trees are ready for you to drop by and pick one for your Christmas holiday! Here are some pictures. 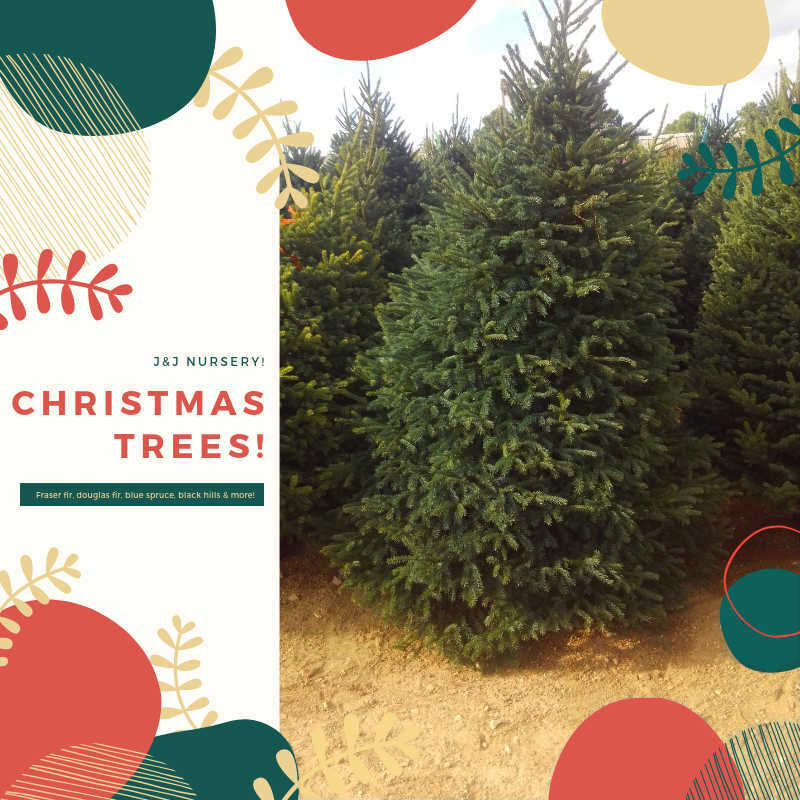 Be Jolly and make good cheer for Christmas Trees from J&J Nursery are here but once a year. Don’t get your tinsel in a tangle! Douglas firs are here! The new Christmas trees from J&J Nursery! This tree is full and wide! Sugar and spice makes Christmas nice. but our Fraser Firs make it better! This tree has fewer branches making it easier to fill up on tree decorations! 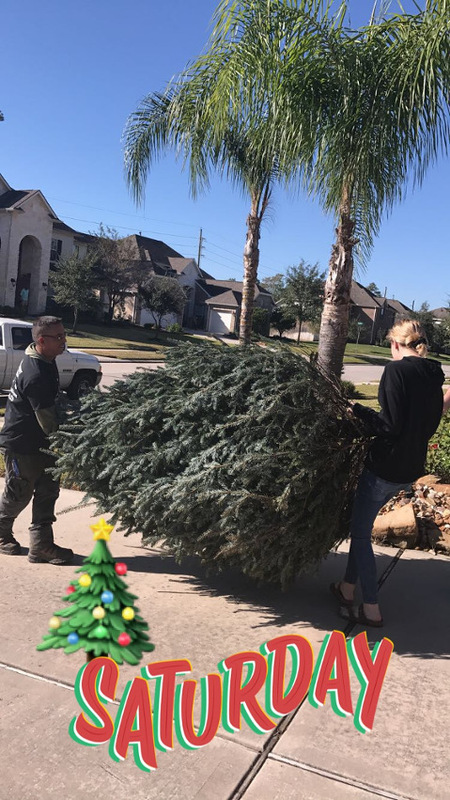 This entry was posted in Christmas, Christmas Trees, J&J's Nursery, Madison Gardens Nursery, Spring, The Woodlands, Tomball, TX and tagged Christmas Trees, Christmas Trees Spring TX, Christmas Trees Tomball TX, Christmas Trees Woodlands TX, christmasspringtx on November 19, 2018 by jjsnursery. Let it snow! There was real snow on the Christmas trees today, 12/8/2017! A rare site to see in Spring and Houston,TX! There’s Snow Place Like Home! Christmas Trees covered with real snow at Madison Gardens Nursery! 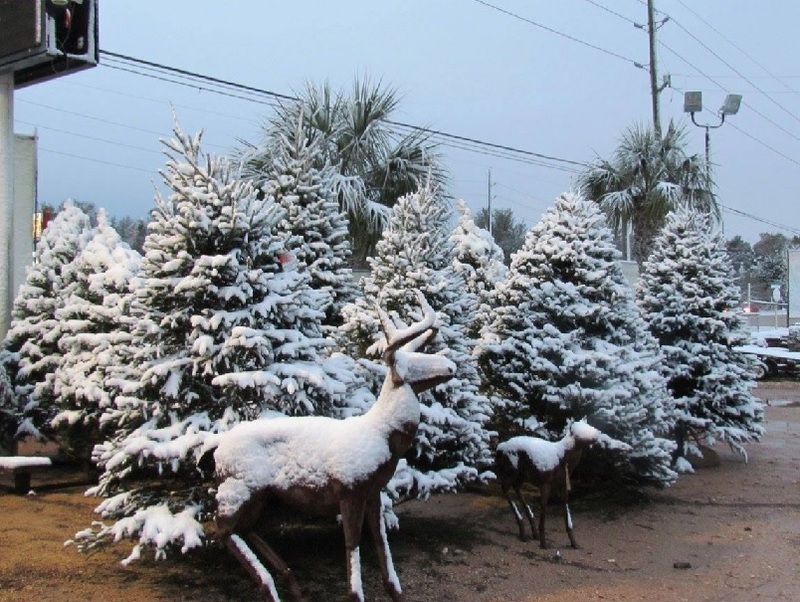 Christmas Trees covered with real snow at J&J Nursery! 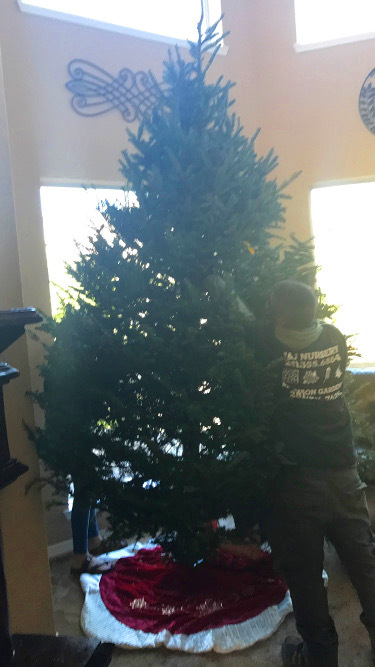 This entry was posted in Christmas, Christmas Trees, J&J's Nursery, Madison Gardens Nursery, Spring, The Woodlands, Tomball, TX and tagged Christmas Trees Spring TX, Christmas Trees Tomball TX, Christmas Trees Woodlands TX on December 8, 2017 by jjsnursery. Santa’s helpers are busy moving Christmas Trees, fresh cutting and adding stands! Taking a Christmas Tree to a customer! All is calm, all is bright, while we put a stand on a Christmas Tree! Putting a stand on a Christmas Tree! 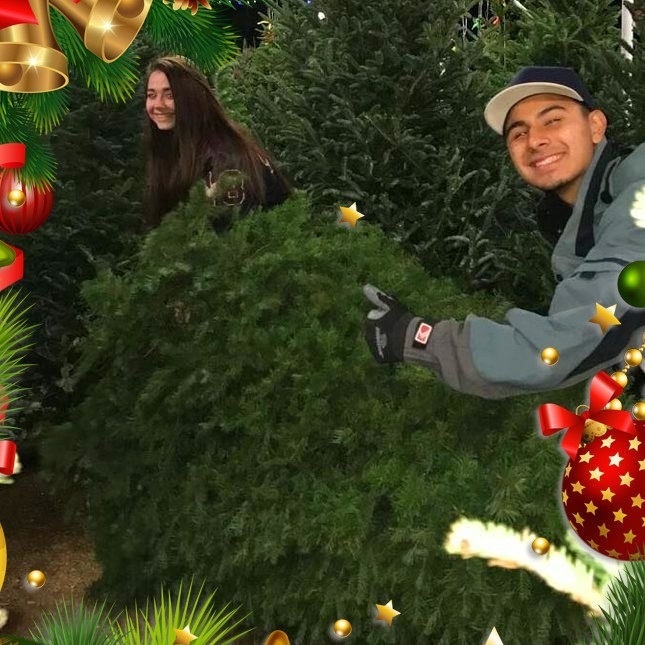 Make it a jolly Christmas with our Christmas Trees. 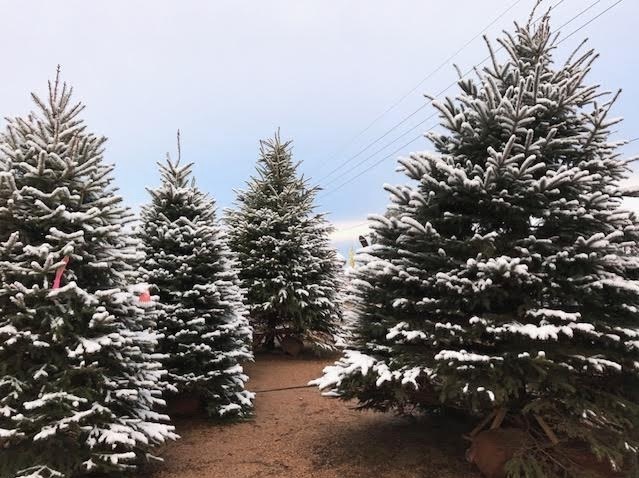 We have Fraser Fir, Blue Spruce, Black Hills Gold, Scotch Pine, White Pine and Nobles! We even have table top trees that are 3-4 feet tall! We offer flocking (fake snow put on your tree) from light to very heavy! We fresh cut trees and put them on a stand! 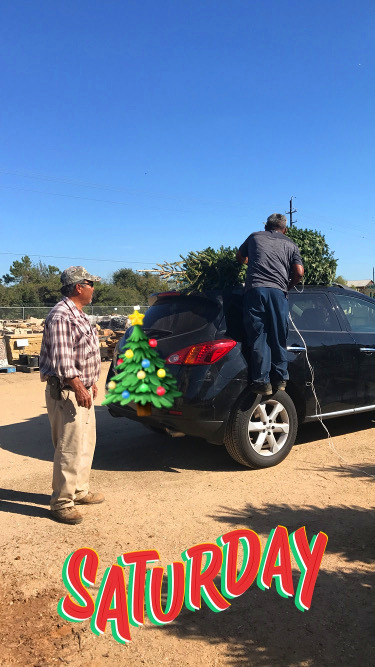 Loading a tree onto a car! Ho, ho, ho! Putting a Christmas Tree on a car! They’ll be dashing through Spring, TX. No grinches here! We’re happy delivering Christmas Trees! 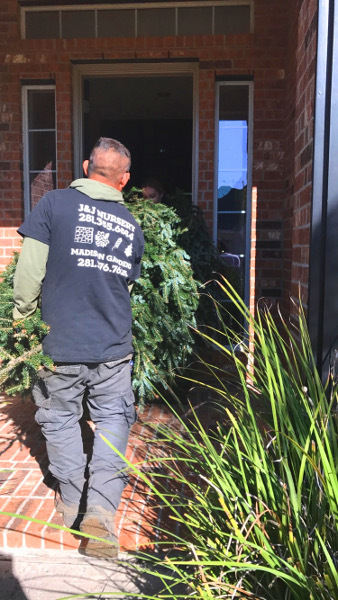 Taking the Christmas tree into the house! 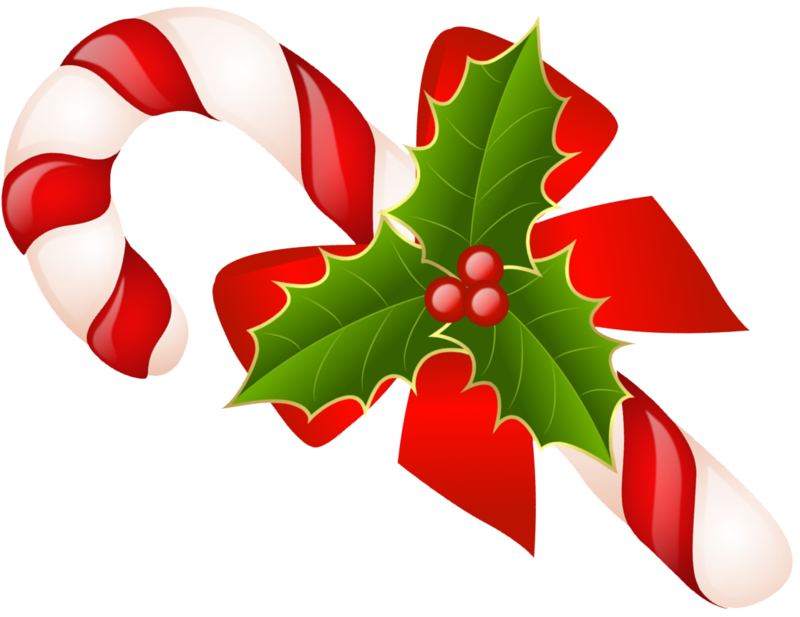 Be Jolly and make good cheer for Christmas comes but once a year. Time to decorate your Christmas Tree with Joy! 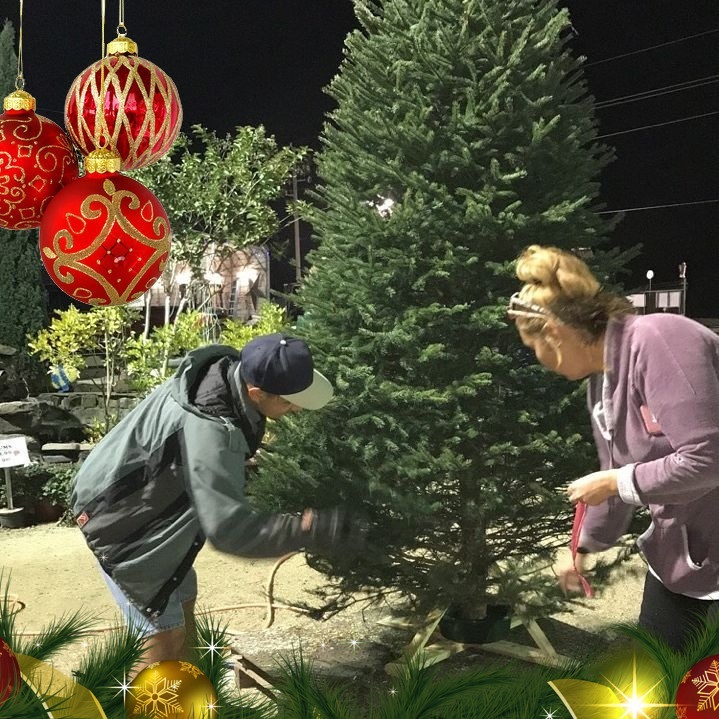 This entry was posted in Christmas Trees, Flocked Christmas Tree, J&J's Nursery, Madison Gardens Nursery, Spring, The Woodlands, Tomball, TX and tagged Christmas Trees Spring TX, Christmas Trees Tomball TX, Christmas Trees Woodlands TX, christmastreeshouston, Flocked Christmas Trees on November 25, 2017 by jjsnursery. Don’t get your tinsle in a tangle! Flocked Christmas trees are available at J&J Nursery! We offer flocking – light, regular, heavy, very heavy! 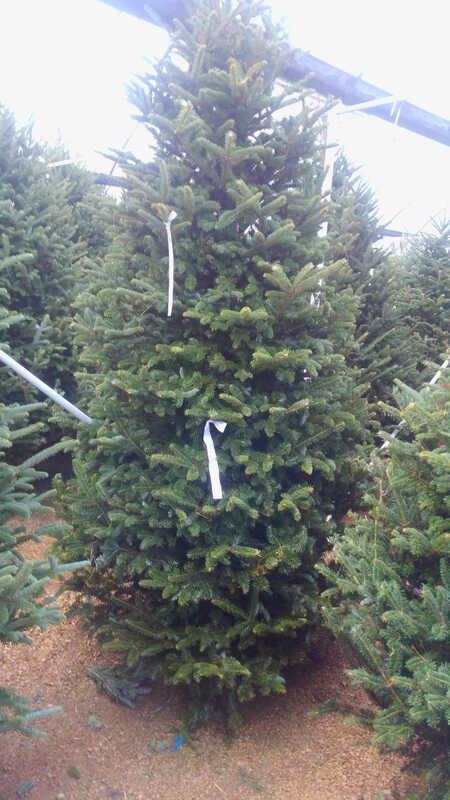 We also carry stands and fresh cut trees. 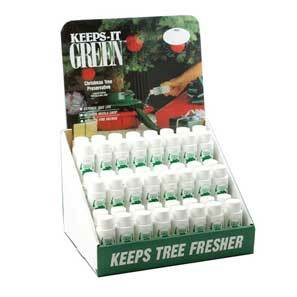 Keeps-It-Green – add to tree water to keep the Christmas Tree green! Superthrive – add to tree water to keep the Christmas Tree green! Santa’s Watering Spout – put spout in the Christmas tree. Especially great for big trees and for people who have bad backs. Christmas Tree Removal Bag and Skirt! This entry was posted in Christmas, Christmas Trees, J&J's Nursery, Madison Gardens Nursery, Spring, The Woodlands, Tomball, TX and tagged Christmas Trees, Christmas Trees Spring TX, Christmas Trees Tomball TX, Christmas Trees Woodlands TX, Flocked Christmas Trees, Flocking on November 17, 2017 by jjsnursery.